The US-based website disputes the claim stating that it is not the subject of Scots law. A Scots guesthouse is suing the Tripadvisor travel review website over a negative review. Richard Gollin, who runs a property in the Hebrides, is launching the legal action over a negative review of his business. In his claim, Mr Gollin alleges that the criticism of the six-bedroomed Baille na Cille guesthouse at Uig on the west coast of Lewis, is false and should have been removed by Tripadvisor. Mr Gollin has launched a small claims action in Stornoway Sheriff Court and maintains the website has "hurt business" through lost bookings. He believes the website, which is the world's largest travel site, is rife with inaccurate or false guest reviews. He said that a scathing posting was made by a guest who criticised the food and claimed visitors were underfed. Mr Gollin defended the quality of meals and insisted "our portions are certainly not small." In his action, he claims the writer gave the wrong date he stayed "to cover his tracks. I believe that that one lie should disqualify his entry." "Tripadvisor is in dereliction of duty in failing to have proper supervision" of what goes on their website. 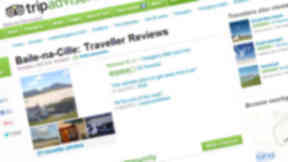 All across the country people should stand up to Tripadvisor." Mr Gollin claims he has lost bookings as a result and is seeking compensation from the USA-based online holiday review guide. The amount of compensation he is seeking has not been disclosed though £3000 is the maximum limit under the small claims procedure. Tripadvisor insists to the court it is not subject to the law in Scotland. Its legal team from its Massachusetts headquarters in the United States has directly instructed Stornoway lawyer Angus Macdonald. He is asking Sheriff David Sutherland to kick the case out of court, claiming it is out with Scottish jurisdiction. Tripadvisor declined to speak about the case. A spokesperson for the travel website said: "We do not comment on threatened or pending litigation."